After the first ten days I feel more at ease. Things that looked exotic and strange to me a week ago seem now familiar. The days pass in a predictable pattern and we don’t get called out at night anymore. We usually set up our surgeries the day before which gives me ample time for preparation. Routine kicks in and I can slowly reclaim my comfort zone. The on-calls are still a bit of a nuisance though. Most patients that are admitted at night have medical conditions which I have forgotten all about and so I have my nose buried deep in the books of medical wisdom every time an asthma or hypertension patients enters the tent. We are five doctors and thus on-call every fifth night and that means we spend 34 hours at the hospital. We are not overwhelmed by work during these night shifts, but it isn’t easy to get good sleep either. We are supposed to sleep in a mosquito dome in the admin tent which happens to be located right adjacent to the main street. Despite the fact that Basey is a quiet town by Asian standards, they manage to keep up quite an impressive noise level: First there are the motorcycles and the stereos that spit out endless streams of old and new love songs in dubious sound quality. The Philippinos really like their softpop songs, which is one of the few things I have to hold against them. After the music has faded into the tropical night, the stray dogs usually call a meeting. It is pretty obvious to the alert listener that a considerable proportion of these dogs is seriously demented, since it takes hours of howling and barking until everybody gets the point. And when the dogs finally have enough at around 5am, the old Spanish church just across the road springs into life. The catholic churches I grew up with back in Bavaria have these huge bells with their soothing and dignified sound. St. Michael church in Basey, on the other hand, has a lot of small and eager bells from spanish times, which enthusiastically herald last judgement day, every day at 5 o’ clock. When Sheryl, our GP from Singapore, gets woken up by the bells on her first on-call, she evacuates the admin tent immediately, sure that these bells are storm bells and that another wave is about to hit Basey.But Catholicism is not quite done with us yet: They really, really want our undivided attention and thus broadcast the morning mess on the loud-speakers. By 6 o’ clock every morning the on-call doctor’s patience with both stray pets and the catholic church is stretched a little thin. But not all is routine. January 8th sticks out as a day I will remember for a long time. 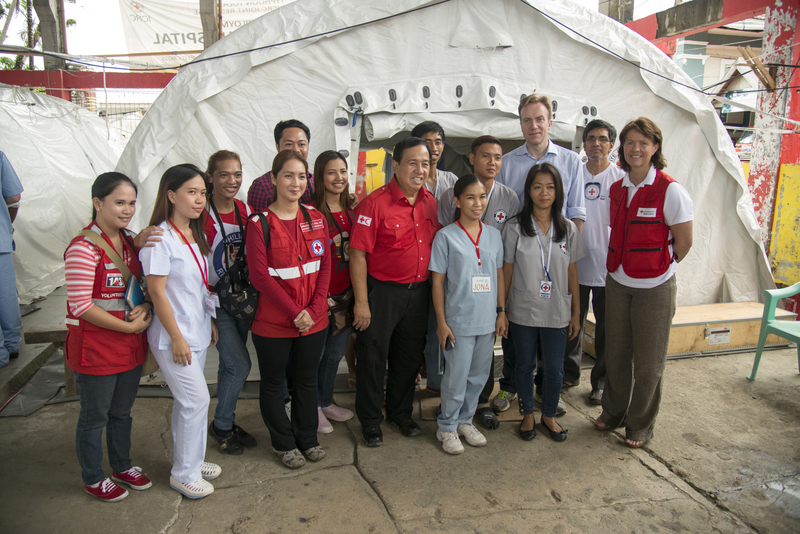 First the Norwegian foreign minister Børge Brende, Norwegian Red Cross general-secretary Åsne Havnelid, Philippine Red Cross general-secretary Gordon and a big entourage including the Norwegian press pay us a visit. The visit is important to keep the Philippines in the news, because there is still a pressing need for donations to finance the rebuilding of homes and livelihoods. But there is more to this day. While our visitors sit down to have lunch, Lindenne Anne is brought to the hospital by her two aunts. Lindenne Anne is an eight year old girl, whose mother died while giving birth to her, and who has been brought up by her very caring and loving aunts. Lindenne Anne has been sick for 10 days when she is admitted to our hospital. What started as an appendicitis has developed into a full obstruction of her bowels. She is undernourished and weak, with a bloated and distended abdomen, and there is little doubt: If she does not undergo an operation immediately, she is going to die. Her aunts are still hesitant and very afraid. Their doubts coupled with their inability to pay for an operation plus some pretty bad advice are the reasons why Lindenne Anne has not been operated earlier. When they finally consent to an operation, none of us know if we can get there in the nick of time or if it’s too late for the little girl. By the time we are finished in the OT our guests have left. If we have managed to stem the tide for Lindenne Anne is impossible to say at this stage. Her chances of recovery are very uncertain and we all are painfully aware that she doesn’t have much to go on. If she develops complications, she is doomed. That same evening she is on the evening news back home in Norway as part of the news coverage of the visit of the foreign minister. For two long days her life hangs in the balance. Then, on the morning of the third day, her bowel sounds come back and she says that she is hungry. From then on things improve al little every day. Her belly gets smaller as her appetite increases. We are all enormously relieved. I see her again two weeks later when her stitches are removed and there I meet a completely different girl: Lively, humorous and very active. She alone would have made my trip to the Philippines worth the while (information and photo published with the permission of her aunts). Thanks to everyone involved in her recovery. Particularly Alvina, one of our nurses from Hong Kong, is an enormous help with all my surgical patients on the ward. Another patient that will stick is Mario. 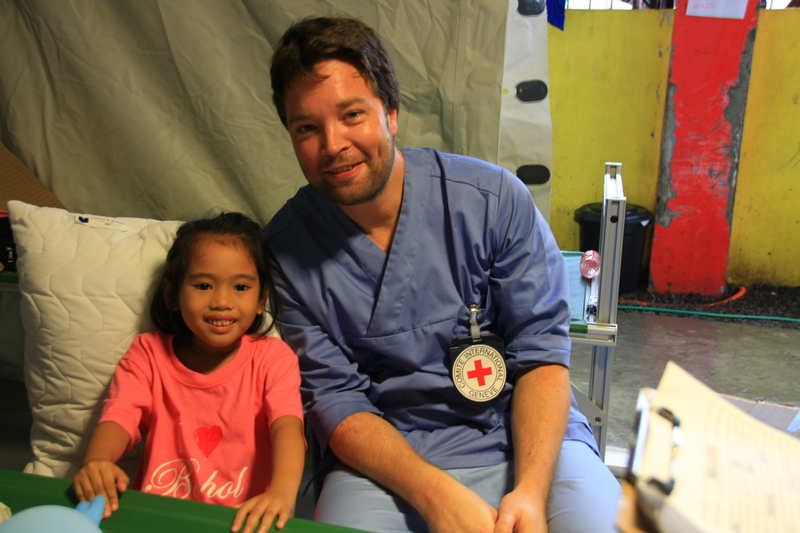 He is ten years old and has been at the field hospital from the very start. He was hit by a motorcycle eight months before Yolanda and was basically paralyzed from the waist down. His mother kept him in bed for all these months and when he came to us he had pressure wounds on his back and he was unable to walk. All the different teams who had been at Basey worked with him over time, and when I arrived he could already walk a little with the help of a chair. Which he pushed ahead while putting one foot in front of the other. He is the mascot of the hospital and gets a lot of attention. With the help of physiotherapy his condition improves gradually. 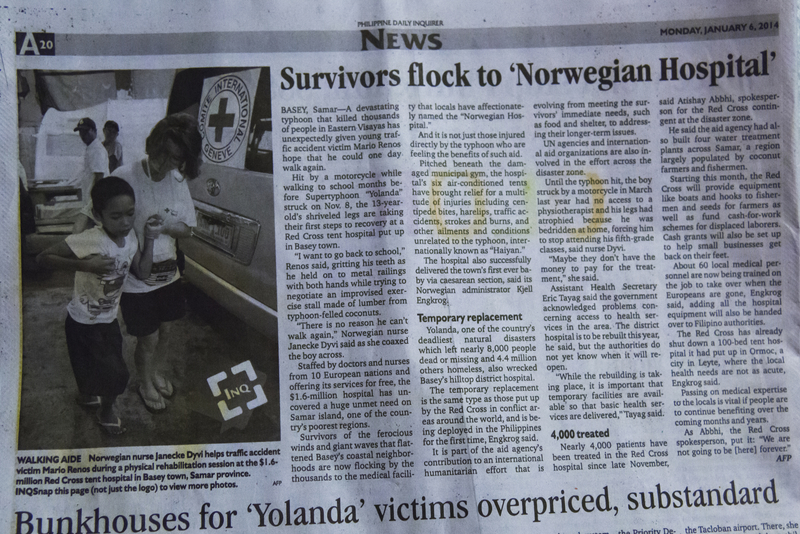 He is a bit of a star nation-wide, since he featured prominently in an article on the Norwegian field hospital in one of the national newspapers. After a while Alex, our technician and guy who fixes everything, finds him a four-pod cane, which gives Mario extra mobility. Our concern is how he will fare when we leave: will he be able to get to and fro school? Will he get enough exercise for his legs? We consider different options, among others to collect money to pay for one year of tricycle taxi transport. In the end we land on a solution that will solve most of the problems at one stroke: Alex buys a childrens’ bicycle in Tacloban and our technicians attach specially welded support wheels to compensate for Mario’s balance problems. It seems to work. Potentially, this will solve his transport problems and will give him regular exercise for his legs. Back in the camp life has improved a lot, too, after the stampede to the 3rd floor of the hotel. We are now dry, our clothes are approaching a state which can be defined as dry, and the torrential rainfalls have diminished considerably. 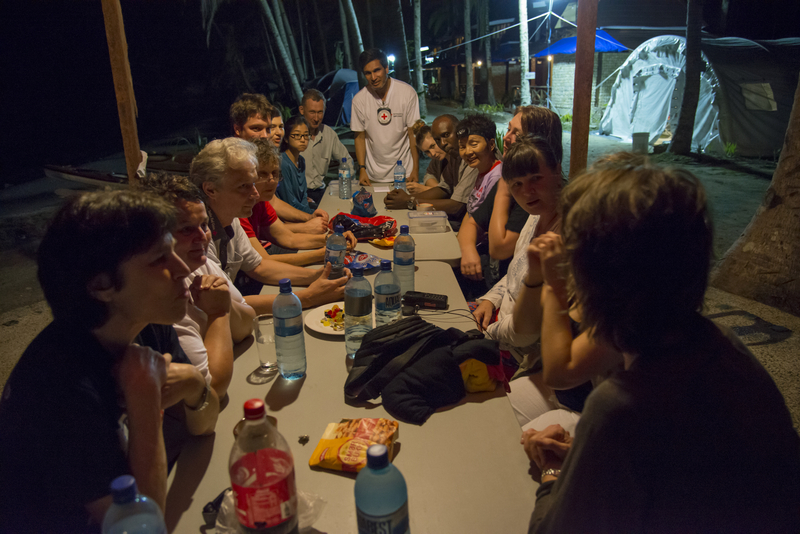 The evenings at the camp are much more pleasant and sociable. ICRC has deployed a lot of different specialist, not just us health people. There is Danielle, an Australian engineer, who does water and sanitation, and Sarah, an Australian psychologist, who gives psycho-social support to the people affected by Yolanda and also to some of our patients at the hospital. Their attempts at promoting Vegemite among the Norwegians are a complete disaster, but they are great company and we get a lot of good laughs during and after dinner. There are also Gafur and Britt, who will stay in Samar for nine months building shelters. They are an inspiring bunch and they all have fascinating jobs and careers which make my daily work back home look at little dull. I spend all day and most of the evenings with my team and we slowly become a family. Under these circumstances it is easy to get to know each other and I grow very fond of each and every member of this little family of delegates. And this is another aspect which makes mission life worth the hardship and the separation from your family: You get to meet like-minded people, dedicated and laid back folks, generous and with a great sense of humor. In other words, people, who will stay with you, one way or the other, for the rest of your life. I somehow have to believe that I will meet them again (and not just in another life) but rather sooner than later. I would go on another mission with any of them any time! 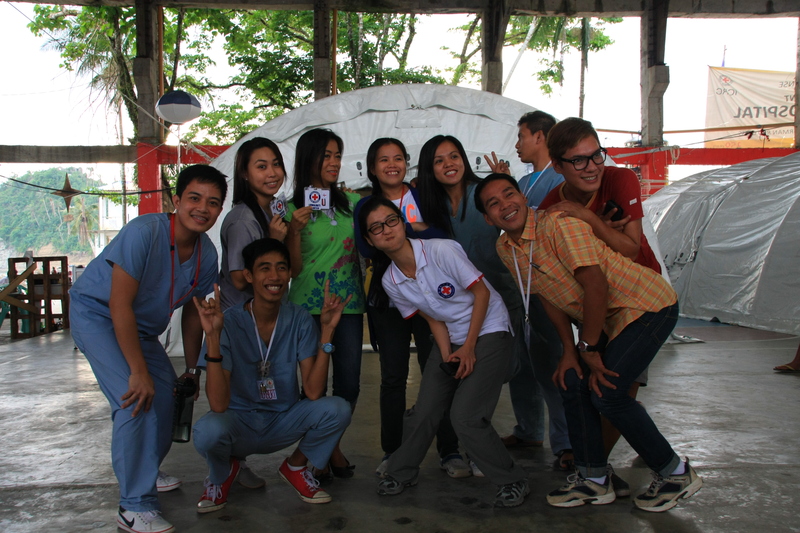 The ICRC hospital team with international delegates and local staff. Towards the end of my stay patient numbers start dropping. Both surgical and medical consultations decline and the whole team agrees that we have played our role. It is time to start wrapping up. The emergency phase is clearly drawing to a close and from now on all emphasis ought to be on recovery. 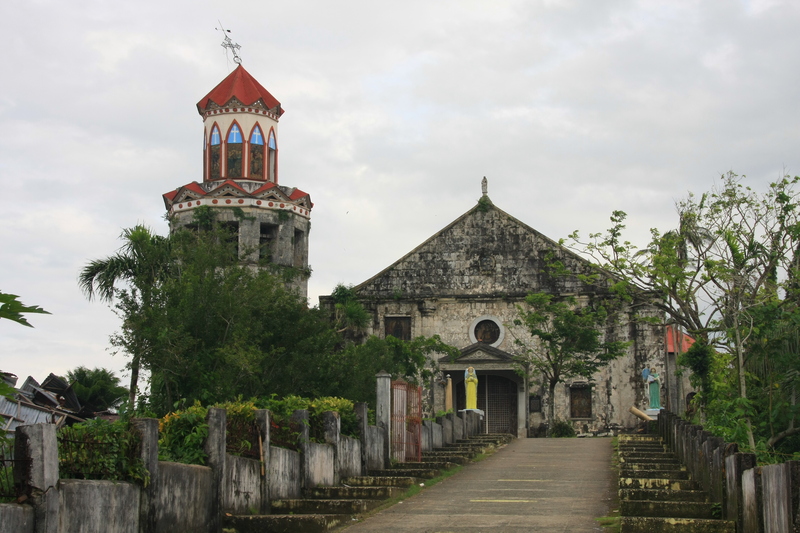 That means that there is no further role for an emergency hospital and that patient care should be taken over by the local hospital, which has largely risen from the ruins after Yolanda. The first decision down this lane is that neither I nor Kirsti will be replaced which means that all surgical activity will come to an end with our leaving. It is always important to find a recipient for the hospital equipment, as taking it back to Norway is not an option. We all agree, that the best plan is to donate the high-tech equipment and the OT to the local hospital. This will give them the opportunity to improve standards of care considerably. If everything works out the way we envision it, the Basey District Hospital may be better off than before Yolanda knocked the old hospital down. 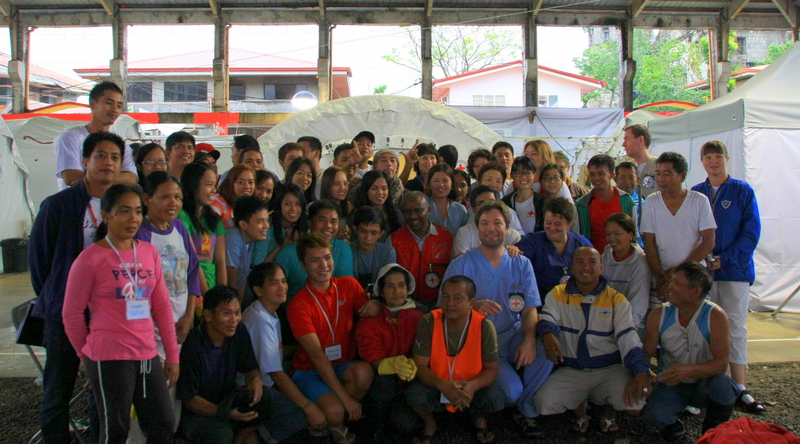 Also Philippine Red Cross will get equipment to improve their capacity which has already proven to be quite impressive. But things that look obvious to the people on the ground can be perceived quite differently by others. The transition is a bit bumpy, but in the end, all pieces of the puzzle fall into place. Personnel and equipment are transferred up the hill. The moving process takes place after I have left, but my colleague Harald, the formidable GP from Kirkenes in the north of Norway, has written a nice blog about the Basey District Hospital and the transfer period. Life on a mission is like living in a bubble, where time passes in a very peculiar rhythm which is neither slow nor fast. Time stands still, while at the same time hours and days disappear at lightning speed. For me it is time to emerge from this bubble, because my time in the Philippines is up. It is time to go home and reunite with my loved ones. My passing words are dedicated to the people of Samar as they have impressed me deeply. They have been living with an unkind nature for generations and they now bear the brunt of what we call climate change. On the political side there is some hope, as the young governor of Samar and the director of Basey District Hospital made a very good impression on everyone and they seem to be genuinely dedicated to the well-being of the people. But the people of Samar toil on, despite the hardship. And amazingly, they are not bitter and they have not given up, but instead they are friendly, smiling, hard-working and grateful for every help that comes their way. And despite their forbidding poverty I am convinced that I could have left my smart phone out in the street without it being stolen. I bow my head to their resilience, their kindness in the face of disaster and their unremitting faith. Many other and more advanced societies would have been broken by what they had to go through. My hope is that they will never have to live through another Yolanda. My hope is that they will get to live in a society where hard work and qualifications are rewarded and where you don’t need to be well-connected to get a job. The people of Samar will do well in such a system, no doubt about it. My hope is that their hard work will bear fruits and that these fruits will not be washed away in another storm. And my hope is that I will meet them again, preferably under better and happier circumstances. General Mac Arthur said famously in 1942, when driven off the islands by the Japanese: “I came through and I shall return.” Although I’m not planning on dramatically wading ashore from a landing craft, I’m sure I will return, too. I would love to show my family around one day and to check on the progress. The Philippines and their valiant people have left a deep mark. My heart goes out to them and I wish them all the best! Some of our local staff plus Alvina in the middle. Cameras are very popular items in these parts of the world. Sven I am enormously impressed by this and so proud to know you. Well done mate. What amazes me most about your selflessness is the fact you are as German as they come! Btw we all know marmite trumps that vegimite rubbish!